I’m behind on my summer movies but determined to catch up. So I went to see Minions this week with my brother (he really enjoyed it) as did a little kid sitting near us who shouted out in amazement everything that came on screen. That is a lot cuter when your actually in a kid’s movie rather than an adult movie someone’s brought a kid to but I digress. 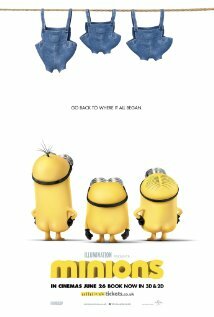 So Minions tells the story of Stuart, Kevin and Bob whom leave the rest of the depressed Minions behind and travel to 1968 New York, Florida and eventually London to find a new and despicable master they can serve. They meet up with Scarlet Overkill (Sandra Bullock) whom along with her inventor husband Herb (Jon Hamm) is plotting to steal the Queen’s crown amongst other dastardly deeds. I think I enjoyed the beginning and the end most. The beginning is a fun little minions through time and the real life villains they screwed it up for and the end was quite fun as well. I also really enjoyed seeing the 60’s style in animation. There were a couple of scenes in a New York department store that I really loved. Stuart, Kevin and Bob are actually really good characters considering they only know a few words including banana and each other’s names. They did an excellent job of really giving them characteristics and differences in the story. Bob was my favorite! As far as the story to me it was very much a kids movie. I know, I know but even here I didn’t laugh as much as I had at Shrek or some of the recent Pixar flicks. It drags a little in the middle and while I thought Sandra Bullock was very good Jon Hamm’s Herb definitely got old quick. It drug a little bit in the middle although that was just me. Like I said the little boy by us was absolutely enthralled. Recommend: Yes. How can one say no to the Minions? But I think you’ll especially enjoy if you were fans of the first Despicable Me movies or have a kid with whom you can watch.